Rare footage has emerged of Magpie goalkicking legend Gordon Coventry in action, kicking a goal during an interstate game in 1933. Action footage of the burly full-forward known as ‘Nuts’ is very thin on the ground: there is a brief newsreel glimpse of him running onto the ground in the 1929 grand final, and another shot from distance apparently of him in the 1930s, kicking a goal against South Melbourne. But this latest footage, uncovered recently by the National Film and Sound Archive, is the clearest and best yet. It shows Coventry, wearing the Big V No.5 jumper, nimbly collecting a loose ball at the end of the goalsquare, turning onto his left foot and – ignoring pleas for a handball from triple Brownlow Medallist Haydn Bunton – snapping a clever goal. Former teammate Billy Libbis, by then with Melbourne, is close by. It was taken during a game against South Australia at the 1933 ANFC Carnival held in Sydney. The game, played at the Sydney Cricket Ground, ended in a 15-point win to the Vics, with Coventry bagging seven goals. 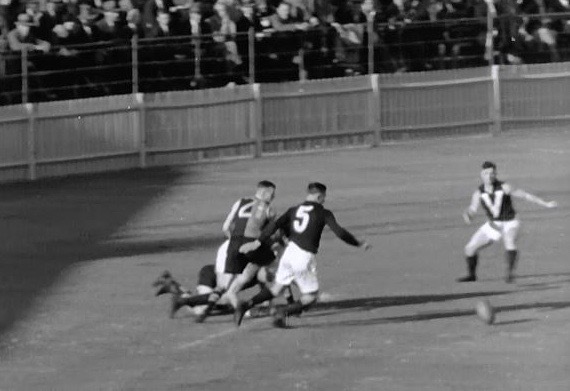 Interestingly, South Australia’s equally famous spearhead, Ken Farmer, also appears in the newsreel footage, snapping a point early in the game. This is the only known action footage of Farmer in action. Gordon Coventry’s equally famous brother, Syd, can be seen in the background of the Farmer snippet, wearing the No.1 jumper.